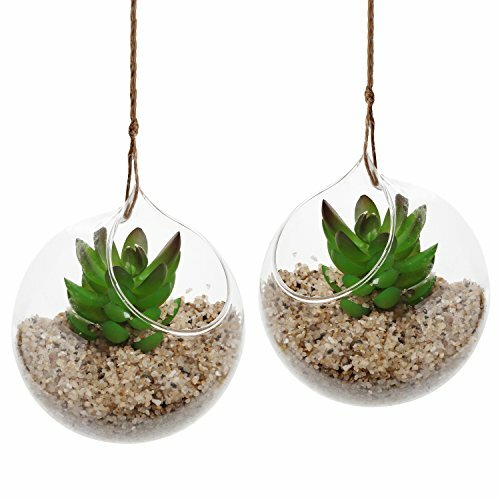 Use this set of two hanging clear glass teardrop globe plant terrariums to add modern elegance and design to any home. Perfect for use as hanging decorative accents, these globes feature a teardrop shaped opening which allow easy access to the round interior. Place small items like succulent plants, air plants, sea shells, and candles in the interior of each globe and then hang the glass ball anywhere you desire to display your favorite knickknacks in any room. Whether you use them yourself or give them as a thoughtful gift, these clear terrarium globes make excellent decorative additions to all kinds of living spaces. Approximate Dimensions (each globe): 5.5" H X 4.75" Diameter.